How to manage requirements and attributes in Editor, in context of the prototype as it's being built. Requirements can be captured and managed throughout the iRise platform. This article provides instructions on how to add, update, and manage requirements and related requirement attributes in Editor, in context of the prototype as it's being built. From iRise Editor, the Requirements Panel can be toggled from the right side of the screen by clicking the Requirements icon. Requirements can be added, updated, duplicated, and deleted from the Requirements Panel. To add a requirement, click the + icon at the top of the Requirements Panel. This will open a text area to capture the title of the requirement. Click enter or navigate away from the title text area to create the new requirement card. To update an existing requirement, double click on the requirement card to open the Requirement Detail Panel. From the Requirement Detail Panel, you can view and/or edit the title, description, and any of the values for the custom attributes that have been defined in the requirements schema. Learn more about the requirements schema here. Related: Capture related components (like screens, requirements, widgets, links, etc.). See Relate Widget section below for more information. Comments: Leave feedback via Comments and optionally leverage @mentions to notify another team member of something instantly via email notification. To mark a requirement complete, click the down arrow icon from the Requirements Detail Panel and select Mark Complete. To link to a card in Manager, click the down arrow icon from the Requirements Detail Panel and select Link to Card. 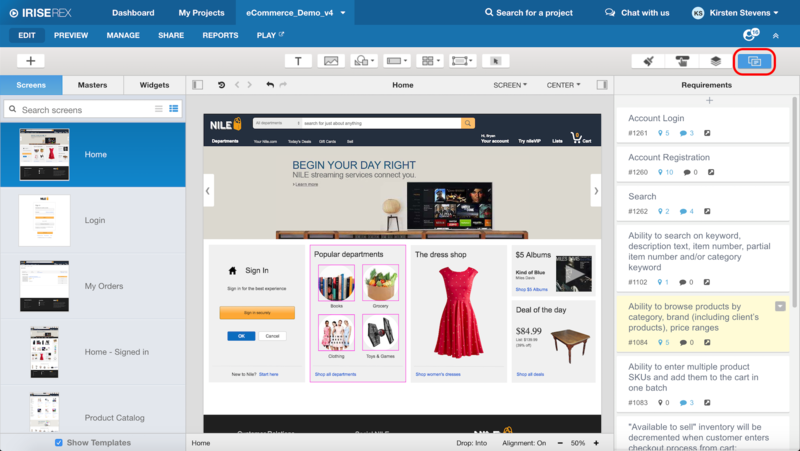 Provide a direct link to users with access to Edit the project to view the requirement in Manager. To duplicate a requirement, click the down arrow icon from the Requirements Detail Panel and select Duplicate. 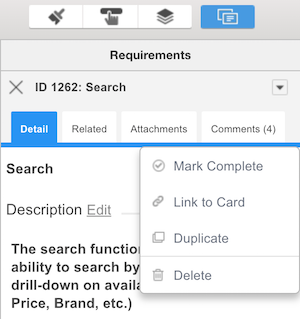 A duplicate requirement card will be created from the selected requirement with a new ID, the title attribute updated to include (Copy), and the remaining attributes duplicated from the original. To delete a requirement, click the down arrow icon from the Requirements Detail Panel and select Delete. A confirmation message will be presented with the text "Are you sure you want to delete this card?". Click the x icon to cancel and the Delete button to permanently delete the requirement. Add context to your requirements by relating widgets from the prototype directly to the requirement that describes it or it's related functionality. For example, if you write a requirement about account registration, in addition to capturing text requirements and custom attributes, you can select the section where a user would register for an account, links the user would click on, alternate registration paths, etc. Widgets can be related to a requirement directly from the Editor Workspace or the Outline Panel. To highlight the existing related widgets for a requirement on the Workspace, click the requirement . Click the pin icon on the requirement card to open the Related Widgets pop-up. Double-click the requirement card and open the Related tab. Click the pin icon on the requirement card to open the Related Widgets pop-up, and click the widget(s) to relate from either the Workspace or the Outline Panel. Double-click the requirement card, open the Related tab, click the +Related Widgets... button, and click the widget(s) to relate from either the Workspace or the Outline Panel. Click the pin icon on the requirement card to open the Related Widgets pop-up, hover over the widget to remove, and click the trash can icon to the right of the widget name. Double-click the requirement card, open the Related tab, hover over the widget to remove, and click the trash can icon to the right of the widget name.